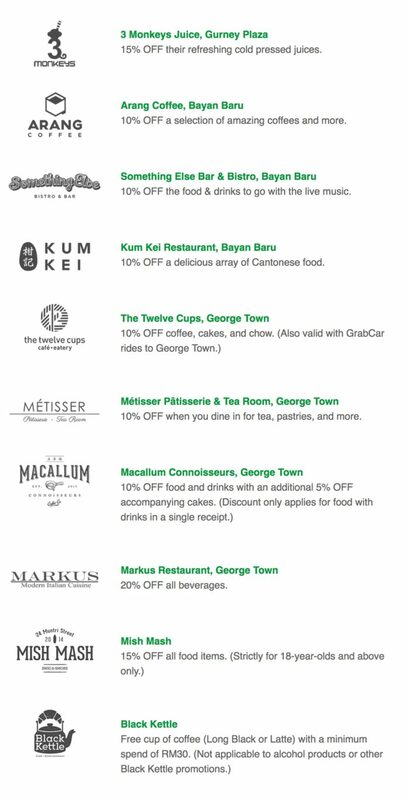 Treat your taste buds in Penang with GrabCar! All you have to do is flash your ride history to an attendant to confirm that you used the Grab app here. To access your history, just click on the Menu on the top left when you access the app and you’ll find history. Valid for GrabCar only. Limited to one GrabCar ride per Grab account only. Valid until 30 April 2017. Promotion can only be redeemed on the same day of the ride taken to the outlets. History of Grab ride to merchant required upon redemption unless stated otherwise. All offers are not exchangeable for cash and/or other goods and services. One offer is valid for one redemption per visit. All offers are generally non transferable to other redemption outlets unless stated in the fine print. All offers not valid with ongoing promotions and discounts unless stated otherwise. No replacement or extension will be given for any expired offer. No cash back or credit will be issued for partial redemption of the promotional portion of the Grab offer. Discount is not valid after payment has been made. Only Black Kettle ‘s Promo will end at 15 June 2017.